MagiCAD Connect is an add-in for Mechanical, Electrical and Plumbing (MEP) designers using Autodesk® Revit® and MagiCAD. When installing MagiCAD Connect, Revit users can download free of charge a selected portion of MagiCAD Cloud’s BIM objects inside native Revit projects in native Revit RFA format. 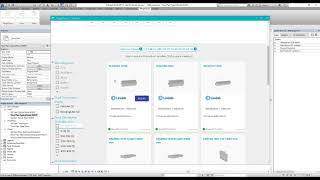 MagiCAD Connect also provides access to MagiCAD Cloud’s online tools for selecting and configuring manufacturer-specific MEP products. MagiCAD Cloud currently features online product selection and configuration tools from the manufacturers Vallox, including a selection of air handling units, and the Purus enabling detailed configuration of floor drains. When the selection tools are accessed via MagiCAD Connect, the selected products can be inserted directly into the Revit project in user-defined product sizes and dimensions. MagiCAD Cloud is currently the only BIM platform to offer online selection and configuration tools for MEP products. Quick access to MagiCAD Cloud BIM object library. Connect enables you to access MagiCAD Cloud libraries and selection tools without leaving your project in Revit and place content directly into your project. Revit compatible BIM objects. When a suitable object is found, the object can be inserted into a Revit project in Revit’s own RFA file format by simply clicking the ‘Install’ button. Free to download and use. Access thousands of BIM objects and some advanced selection tools that will save you time and money. MagiCloud Connect is now MagiCAD Connect. To learn more about the re-branding please visit https://www.magicad.com/en/blog/2019/01/progman-unifies-its-brands-under-magicad/ The latest changes: -A permalink is added as a family parameter via which the user can access the product information. -It is now possible to open the User Guide for MagiCAD Connect via a "Help"-button, instead of just using "F1" on the keyboard. -An "About"-button has also been added which gives the user more details of the currently installed MagiCAD Connect version -We do now support Microsoft's Edge browser as a default web browser for the users. MagiCAD Connect enables you to search Revit compatible product models from MagiCAD Cloud’s wide selection and insert them effortlessly into your design drawing. Have access to manufacturer’s MagiCAD Selection Tools which will make selecting the correct product for your design that much easier.